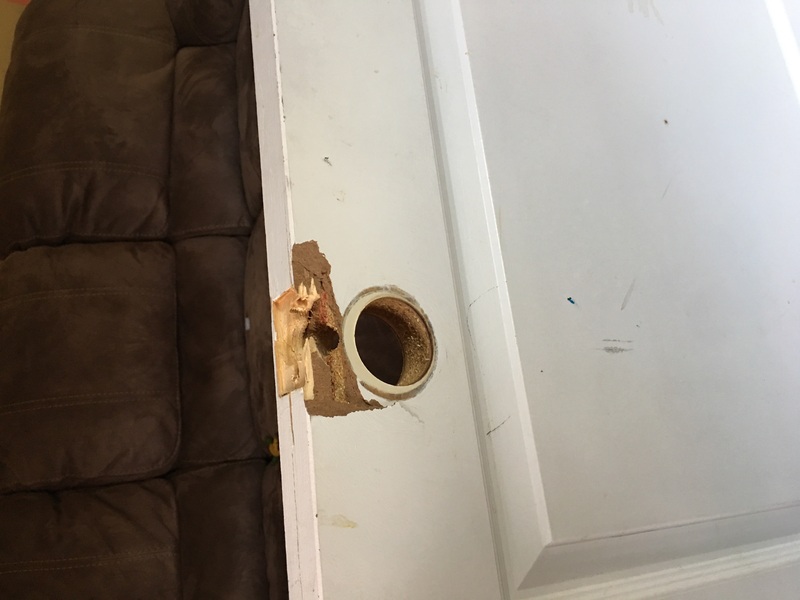 Help need help fixing door. Is this still fixable or not? I'd glue and clamp the wood to put it back together, then install a door reinforcement plate. Interior doors are usually 1-3/8" thick. Exterior are 1-3/4" thick. I wouldn't. I'd spend 20 bucks at Restore, or free from used_your_city_name_here.com, craigslist, or whatever your local buy-sell-trade site is. This is repairable, but all repairs are a trade off of effort vs results. Used doors in good condition can be had for free or nearly free. The "proper", lasting, way to repair this would be to cut out and replace the entire section (~8+ inches height by ~3 inches in guessing from the photo), re-drill, etc. If you did this right you would end up with a door that was solid and functional, but still obviously repaired. Just not worth it. Long process, multiple waiting for it to dry. But better that than a bad job. The proper technique for this kind of repair would be to install a dutchman. Shipwrights and boatwrights regularly do this sort of thing. Cut away the damaged wood along the edge of the door, plus maybe 4–5 inches past the damage on either side. Taper the cut on either end, so the ends of the cut come smoothly out of edge of the door. Then, carefully cut and fit a piece of wood to the recess. Make it maybe a 1/4 inch thicker than the door, and maybe a little less proud on the edge of the door. 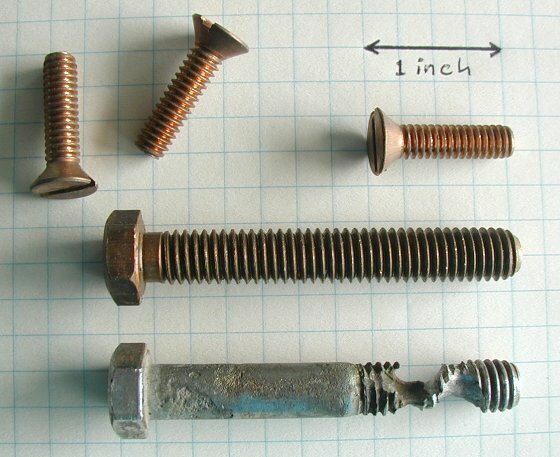 If you have a really good fit, you can glue it and clamp it in place with resorcinol — Titebond 2 or 3 would probably work, too (but they all require a good fit and high clamping pressures to achieve a solid, strong glue line). Otherwise, if your woodworking-fu is not up to snuff, glue it and clamp it in place with a good epoxy like System 3 or West System. Epoxy is tolerant of thickish glue lines and actually likes rather lower clamping pressures (joint starvation weakens things). If your fit is really sloppy, mix 2 batches of epoxy, one un-thickened, and the other thickened with wood flour, microfibers or fumed silica to a paste-like consistency. These thickeners will be available from your epoxy vendor. Prime both surfaces with the un-thickened epoxy, and then, while it's still wet, apply a sufficiency of thickened epoxy and clamp it up. If you do thicken it with fumed silica, remember that it is essentially powdered quartz. Once the epoxy sets, sanding or cutting this will be nearly impossible. Make sure you trim away as much excess as possible while the epoxy is still "green" — after it's started to set, but is still rubbery. Note that you don't actually need clamps for something like this: maybe 4-6 screws, 2-3 on either side of the damage, coated in mold release or wax and driven through the edge of the dutchman into the edge of the door will suffice. If you use screws, dry-fit the dutchman and pre-drill both it and the door for the screws. Then, a few minutes worth of work with a sharp block plane to fair everything up and bring the surfaces flush with the existing surface, and you're ready to paint. At least as strong, if not more strong, than the original wood. You'll have to redo the lockset installation, as well. I would fill the broken area with builders bog and then sand it back to square. I did this with a door at my place. Maybe inject some wood glue and clamp the cracks first. Not the answer you're looking for? Browse other questions tagged repair doors doorknob or ask your own question. 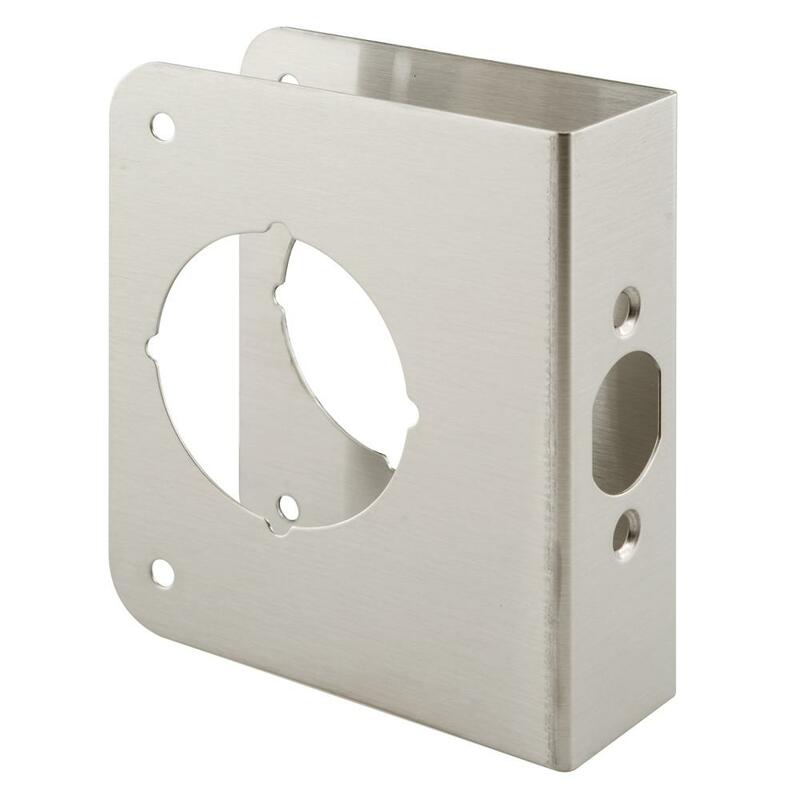 How do I stabilize a knob on a hollow-core bifold door? At what height should a door knob be? 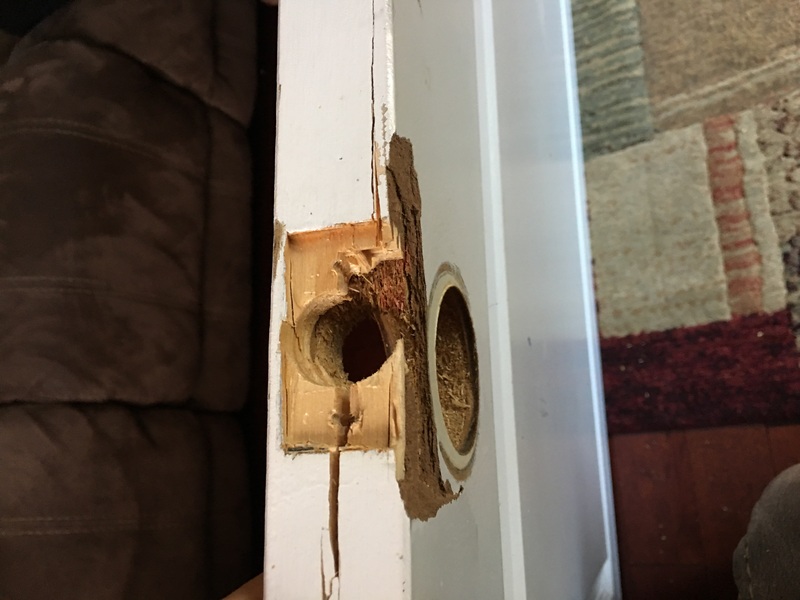 How to fix a damaged door frame? Why can I no longer turn the knob of my self-locking door from the inside?